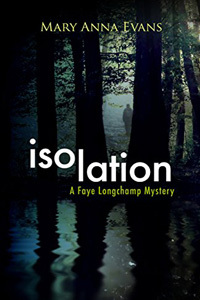 Isolation by Mary Anna Evans: Synopsis and Online Purchase Options. Synopsis (from the publisher): Archaeologist Faye Longchamp-Mantooth has dug herself a deep hole and she can't make her way out of it. As she struggles to recover from a shattering personal loss, she sees that everyone she loves is trying to reach out to her. If only she could reach back. Instead she's out digging holes all over her home, the Florida island of Joyeuse. In their old plantation home, Joe Wolf Mantooth is surrounded by family — Faye, the wife he loves; their toddler son he adores; and his father, who hasn't gotten around to telling him how long he's been out of prison or how he got there — yet Joe has never felt so helpless or alone. Then a close friend at the local marina is brutally murdered, the first in a string of crimes against women that rocks Micco County. Joe, desperate to help Faye, realizes she is in danger from both her inner demons and someone who has breached the island's isolation. Local law and environmental officials say they want to help, but to Faye and Joe they feel more like invaders. A struggling Faye reaches back over a century into her family's history for clues. And all the while, danger snakes further into their lives, threatening the people they love, their cherished home, even the very ground — some of it poisoned — beneath their feet.